“Mankind is a rope fastened between animal and Overman – a rope over an abyss. A dangerous crossing, a dangerous on-the-way, a dangerous looking back, a dangerous shuddering and standing still. I love those who do not know how to live unless by going under, for they are the ones who cross over. I love the great despisers, because they are the great venerators and arrows of longing for the other shore. I love those who do not first seek behind the stars for a reason to go under and be a sacrifice, who instead sacrifice themselves for the earth, so that the earth may one day become the Overman’s. I love the one who lives in order to know, and who wants to know so that one day the Overman may live. And so he wants his going under. I love the one who works and invents in order to build a house for the Overman and to prepare earth, animals and plants for him: for thus he wants his going under. I love the one who loves his virtue: for virtue is the will to going under and an arrow of longing. I love the one who does not hold back a single drop of spirit for himself, but wants instead to be entirely the spirit of his virtue: thus he strides as spirit over the bridge. I love the one who makes of his virtue his desire and his doom: thus for the sake of his virtue he wants to live on and to live no more. I love the one who does not want to have too many virtues. One virtue is more virtue than two, because it is more of a hook on which his doom may hang. I love the one whose soul squanders itself, who wants no thanks and gives none back: for he always gives and does not want to preserve himself. I love the one who is ashamed when the dice fall to his fortune and who then asks: am I a cheater? – For he wants to perish. I love the one who casts golden words before his deeds and always does even more than he promises: for he wants his going under. I love the one who justifies people of the future and redeems those of the past: for he wants to perish of those in the present. I love the one who chastises his god, because he loves his god: for he must perish of the wrath of his god. I love the one whose soul is deep even when wounded, and who can perish of a small experience: thus he goes gladly over the bridge. I love the one whose soul is overfull, so that he forgets himself, and all things are in him: thus all things become his going under. I love the one who is free of spirit and heart: thus his head is only the entrails of his heart, but his heart drives him to his going under. I love all those who are like heavy drops falling individually from the dark cloud that hangs over humanity: they herald the coming of the lightning, and as heralds they perish. All creatures so far created something beyond themselves; and you want to be the ebb of this great flood and would even rather go back to animals than overcome humans? But whoever is wisest among you is also just a conflict and a cross between plant and ghost. But do I implore you to become ghosts or plants? The Overman is the meaning of the earth. Let your will say: the Overman shall be the meaning of the earth! I beseech you, my brothers, remain faithful to the earth and do not believe those who speak to you of extraterrestrial hopes! They are mixers of poisons whether they know it or not. They are despisers of life, dying off and self-poisoned, of whom the earth is weary: so let them fade away! Once the sacrilege against God was the greatest sacrilege, but God died, and then all these desecrators died. Now to desecrate the earth is the most terrible thing, and to esteem the bowels of the unfathomable higher than the meaning of the earth! Once the soul gazed contemptuously at the body, and then such contempt was the highest thing: it wanted the body gaunt, ghastly, starved. Thus it intended to escape the body and the earth. Oh this soul was gaunt, ghastly and starved, and cruelty was the lust of this soul! But you, too, my brothers, tell me: what does your body proclaim about your soul? Is your soul not poverty and filth and a pitiful contentment? Truly, mankind is a polluted stream. One has to be a sea to take in a polluted stream without becoming unclean. Behold, I teach you the Overman: he is this sea, in him your great contempt can go under. What is the greatest thing that you can experience? It is the hour of your great contempt. The hour in which even your happiness turns to nausea and likewise your reason and your virtue. Have you yet spoken thus? Have you yet cried out thus? Oh that I might have heard you cry out thus! Not your sin – your modesty cries out to high heaven, your stinginess even in sinning cries out to high heaven! Where is the lightning that would lick you with its tongue? Where is the madness with which you should be inoculated? “We have heard enough already about the tightrope walker, now let us see him too!” And all the people laughed at Zarathustra. But the tightrope walker, believing that these words concerned him, got down to his work. Markt is the word used by Nietzsche, here translated literally, market. It does not refer only to the place of purchase and sale of goods but, in general, to a spacious place where people meet, the public square. Even today the central square of many German cities is called Marktplatz. “Crying to Heaven” is a biblical expression. See Genesis, 4, 10: “And he said, What hast thou done? the voice of thy brother’s blood crieth unto me from the ground” (words of Yahweh to Cain). As he almost always does with these biblical “quotes,” Zarathustra gives it an antithetical sense from that in the original. “This wanderer is no stranger to me: many years ago he passed by here. Zarathustra he was called; but he is transformed. Back then you carried your ashes to the mountain: would you now carry your fire into the valley? Do you not fear the arsonist’s punishment? Zarathustra is transformed, Zarathustra has become a child, an awakened one is Zarathustra. What do you want now among the sleepers? “Why,” asked the saint, “did I go into the woods and the wilderness in the first place? Was it not because I loved mankind all too much? “Give them nothing,” said the saint. “Rather take something off them and help them to carry it – that will do them the most good, if only it does you good! The saint laughed at Zarathustra and spoke thus: “Then see to it that they accept your treasures! They are mistrustful of hermits and do not believe that we come to give gifts. To them our footsteps sound too lonely in the lanes. And if at night lying in their beds they hear a man walking outside, long before the sun rises, they probably ask themselves: where is the thief going? “And what does the saint do in the woods?” asked Zarathustra. The saint answered: “I make songs and sing them, and when I make songs I laugh, weep and growl: thus I praise God. When Zarathustra had heard these words he took his leave of the saint and spoke: “What would I have to give you! But let me leave quickly before I take something from you!” – And so they parted, the oldster and the man, laughing like two boys laugh. The above German-English translation by Adrian del Caro is taken from Thus Spoke Zarathustra (Cambridge University Press, 2006). This Cambridge edition lacks the more detailed notes by Andrés Sánchez-Pascual in Así Habló Zaratustra (Madrid: Alianza Editorial, 2014). I have translated Sánchez-Pascual’s notes to English. See, in this first part, “On the Hinterworldly,” and “On the Way of the Creator,” and in the second part, “The Soothsayer,” where reference to ashes reappears. The ash is symbol of cremation and rejection of false juvenile ideals. The “awakened one” is a common epithet of Buddha, which applies here to Zarathustra. martyrized until he withdraws into solitude. 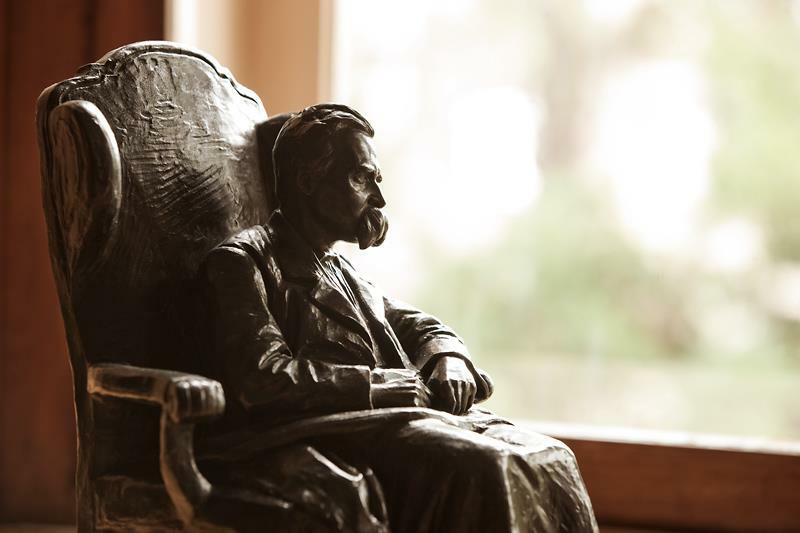 Nietzsche lived in many different towns; he travelled into countless realms of the mind; frequently he endeavoured to escape from solitude by crossing a frontier into a foreign land; but always his journeyings brought him back to solitude, heartsore, weary, disillusioned. His solitude had become complete isolation, the final, the seventh, solitude, wherein one is not merely alone but also forsaken. A void surrounded him, an awe-inspiring silence; no hermit or anchorite in the desert was ever more abandoned. They, at least, still had their God whose shade dwelt in their huts. But he, “the murderer of God,” had neither God nor man to companion him. To the extent that he drew nearer to himself, he receded from the world; and, as his voyages extended, “the desert widened” around him. Generally the works conceived and written in loneliness gain more and more ascendancy upon the minds of men; by a magnetic force they attract increasing numbers of admirers into the invisible circle of their influence. But Nietzsche’s books alienated even his friends. In Germany no publisher would any longer accept his manuscripts. During his twenty years of production, his manuscripts accumulated in a cellar and came to weigh many hundredweight. He had to draw upon his own slender resources in order to get his books printed. Not only did nobody buy the few volumes that were issued, but he found no readers when he gave them away. So vast was the chasm between this man’s genius and the pettiness of the time. Practically no reviewer or critic took the slightest notice of Zarathustra, which the author described as “the greatest gift ever bestowed upon men.” One day he lamented: “After such an appeal as my Zarathustra, a cry that came from my heart, it is terrible not to hear a responsive word, to hear nothing, absolutely nothing, to be surrounded by silence, to be a thousand times more isolated than heretofore. This is a situation exceeding all others in horror; even the strongest might die under the strain… And I am far from being the strongest. Sometimes it seems to me as though I were indeed wounded unto death.” This gnawed at his vitals, undermining his proper pride, inflaming his self-assertive impulse, consuming his soul. Lack of recognition was the shaft which poisoned his isolation, and raised his temper to fever-heat. “Prolonged silence has exasperated my pride.” At all costs he wanted response, sending letter upon letter, telegram upon telegram. Blindly and wildly he flung his missiles far and wide, never looking to see if they hit the mark. Since he had slain the gods, he set himself up as a divinity. “Must we not become gods if we are to be worthy of such deeds?” Having overthrown all the altars, he built an altar for himself in order to praise himself, seeing that no one else would acknowledge him. He chanted his own dirge with enthusiasm and exultation, mingling it with songs celebrating his deeds and his victories. To begin with, a twilight covered the landscape of his mind as when black clouds stalk up from the horizon and distant thunder growls; then a strident laugh rent the sultry air, a mad, violent, and wicked laugh full of despair, heartbreaking: this was the pæan of Ecce Homo. For many years music remained a private amusement to which Nietzsche delivered himself up in a spirit of irresponsible pleasure, with the pure delight of an amateur, a pastime altogether outside his main “mission” in life. Music flooded his being only after the philological crust had been removed, only when his erudite objectivity of outlook had become disintegrated, when his cosmos had been shattered as if by a volcanic eruption. Precisely because he had pent up these primal springs of his nature for so long behind the damns of philology, erudition, and indifference, did they gush forth so vehemently and penetrate into every crevice, irradiating and liquefying his literary style. It was as if his tongue, which had hitherto sought to explain tangible things, had suddenly refused its allotted task and insisted upon expressing itself in terms of music. Even his punctuation—unspoken speech—his dashes, his italics, could find equivalents in the terminology of the elements of music. The details of each work are vibrant with music, and the works as a whole read like symphonies. They no longer belong to the realm of architecture, of intellectual and objective creations, but are the direct outcome of musical inspiration. Of Thus Spake Zarathustra he himself says that it was written “in the spirit of the first phrase of the Ninth Symphony.” And how better can I describe the opening of Ecce Homo than as a magnificent organ prelude destined to be played in some vast cathedral? “Song of Night” and “Gondolier’s Chanty” resemble the croonings of primitive men in the midst of an infinite solitude. When was his inspiration more joyous and dancing, more heroic, more like a lilting cadence of the Grecian music of antiquity, than in the pæan indited during his ultimate outburst of happiness, in the Dionysian rhapsody? Illuminated from on high by the pellucid skies of the South, soaked from beneath by the waters of music, his language became as it were a wave, restless and immense. The world had forsaken him; his friends had long since gone their ways and ignored his existence; his thoughts strayed forth on interminable pilgrimages. Music alone walked by his side, accompanying him into his final, his seventh, solitude. When in the end he fell into the abyss, she watched over his obliterated mind. Overbeck, coming into the room after the catastrophe, found the unhappy madman sitting at the piano, his fingers fumbling the keys in a vain effort to find the harmonies so dear to him.